She is a shining example of true and pure love. Made with 100% 14k yellow gold and brilliant Diamonlux™ CZ's, this glorious Virgin Mary necklace is a meaningful treasure she will love wearing everyday. 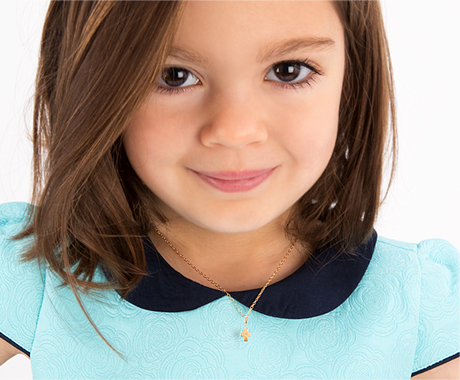 Securely strung onto our exclusive Tiny Blessings Italian-made chain, featuring adjustable sizes to accommodate your fast-growing girl. Elegantly gift wrapped in our signature blue box, with keepsake pouch and certificate of authenticity, this is a beautiful gift of faith for her First Holy Communion.